The pressure on our coasts and seas are increasing – climate change, marine litter and demand for resources are impacting upon the habitats and species that make Pembrokeshire a unique place to live and work. Pembrokeshire Coastal Forum (PCF) established a Coastal Curriculum programme to bring these issues into the classroom, educating young people and inspiring them to live a more sustainable lifestyle. Coastal Curriculum deliver workshops both in schools and out their coastal sites, and they cater sessions to suit all key stages. Pupils learn about how geography and history have shaped our coast and communities and with expert contributors from PCF’s networks, groups can observe the processes at work and the management of our changing coastline. There are opportunities to study the coastal history alongside current human uses of the marine environment and its impacts. PCF is the home of Marine Energy Wales and they also deliver workshops on marine renewable energy, developing pupils’ understanding of the benefits of renewable energy, and introducing them to people at the forefront of this innovative new sector. Their Coastal Curriculum benefits pupils by allowing them to learn from local people who are experts in their field. Getting pupils out of the classroom and learning outdoors results in a range of positive effects on their personal health and well-being, both physically and mentally. It also benefits schools and teachers by providing them with free lessons that are designed to fit in with the National Curriculum and aid with the delivery of difficult and complex topics, such as climate change and integrated coastal zone management. Cash4Change C4C is a project where students can bid for money to make changes at their campus. This scheme was set up by the college and Coleg Gwent Student’s Union CGSU to support projects, clubs, events and ideas that make life at Coleg Gwent more enriching, benefit the college and local community and improve the environment. The project is shared widely through the college ‘Intouch’ newsletter, email and online and the CGSU sit on the judging panel where students can obtain funding. The learners’ objectives mean that any projects submitted have to provide a focus on local amenities, local groups, local projects, the wider community, nature, the environment, citizenship or raising awareness or any other area which is relevant to the learner’s course. This approach also helps to develop vital skills such as innovation and creativity, problem solving, personal effectiveness and digital literacy. As well as supporting the development of personal skills and underpinning the Welsh Baccaulaureate challenges. Recently funded projects have included the Crosskeys Campus (ILS) working with the Adult Education Learning Disabilities Torfaen/Woodchip Group, where they converted a bike shed into a sensory outdoor classroom. Students have also set up a pop-up shop selling products that are made via their curriculum areas. It provides voluntary hours/work experience and providing signposting for business start-up ideas. This project Cash 4 Change has really supported and impacted future membership from an employer, organisation, charity perspective, staff and learners because it has brought significant benefits to all parties involved. Because of its huge success the project will continue for the foreseeable future. Size of Wales is an international climate change charity whose prime purpose is to mitigate carbon dioxide emissions by supporting rainforest protection and reforestation programmes in developing countries. Their education programme reaches around 20,000 young people in Wales every year through the delivery of free bilingual assemblies and workshops to those in Foundation Stage to Key Stage 4. The annual highlight is their MockCOP event which they run jointly with the Welsh Centre for International Affairs. The project aims to educate the next generation and develop their understanding of international conflict resolution and the political issues surrounding climate change. Teams of young people aged 14-18 from all over Wales take part in this bilingual model United Nations conference on climate change, held at the debating chamber of the National Assembly for Wales in Cardiff. 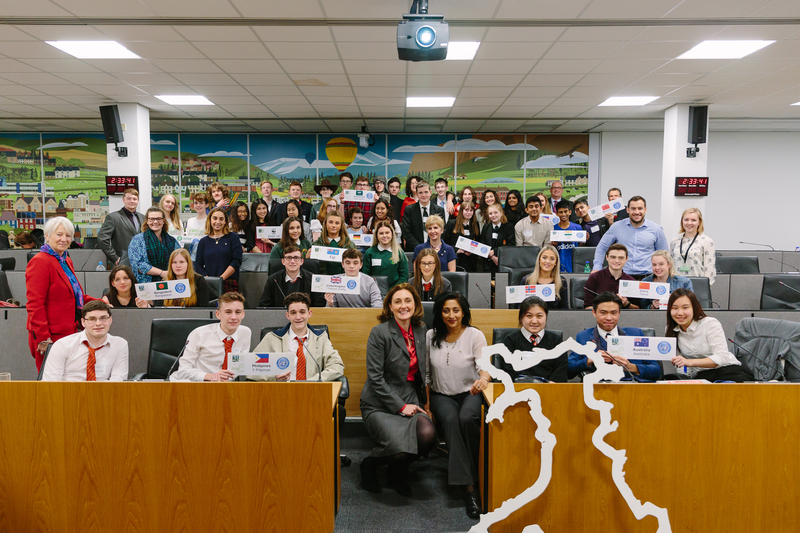 As a result of taking part, participants reported increased confidence, improved negotiation and debating skills, and a much deeper understanding of international conflict resolution and the political issues surrounding climate change. Pupils learnt about the importance of global consensus to tackle global challenges but also the importance of taking collective action locally. In addition, the project benefits the development of young people’s global citizenship skills in the categories of skills, knowledge and understanding, and values and attitudes as well as improving teachers’ confidence in delivering global learning.